The lidar level 3 (L3) ice cloud product reports global distributions of ice cloud extinction and ice water content (IWC) histograms on a uniform spatial grid. All L3 parameters are derived from the CALIPSO version 4.10 level 2 (L2) 5 km cloud profile products, with a temporal arrogation of one month. Three L3 data files are generated each month depending on lightening conditions: day time only, night time only, and both day and night. The L3 ice cloud product report monthly aggregation of ice cloud properties. Granules straddling two consecutive months have been examined carefully to make sure each portion has been included in the corresponding month. Table 1 lists the spatial and coverage of this product. They are specially designed to be compatible with the L3 tropospheric aerosol product. The spatial resolution for L3 ice cloud product is 2.5° longitude by 2.0° latitude and 120 m altitude. For L3 aerosol product, it is 5.0° longitude by 2.0° latitude and 60 m altitude. Both products start to count from the same lower altitude boundary. However, L3 ice cloud product has a higher upper altitude boundary than L3 aerosol product does, i.e., 20.2 km vs. 12.0 km. More details could be found in the Detailed Quality Statement web page. Table 1: The spatial coverage and resolution of L3 ice cloud product. Accordingly, the scientific datasets (SDS) are described as two-, three-, or four-dimensional (2D, 3D or 4D) arrays depending on their purpose. Table 2 summarizes the dimensions of SDS. Table 2: Number of dimensions and dimension lengths of SDS of L3 ice cloud product. The full ice cloud extinction coefficient and IWC distributions are described with 44-bin histograms. Even though the bin boundaries arrays for extinction coefficient and ice water content are 2-D array, the array size is different from that in Table 2. The array size is 44 bins by 3 boundaries: upper boundary, middle boundary and lower boundary. The version 1.00 of L3 ice cloud product are processed from V4.10 level 2 (L2) 5 km cloud profile product as shown in the following Table 3. Table 3: Lidar Level 2 Input Data for Level 3 Ice Cloud Product V1.00. Due to an elevated frequency of low energy shots within and near the Southern Atlantic Anomaly region since late May 2017, all L3 products including this L3 ice cloud product have been stopped processing after December 2016. The lidar science working group is currently working on understanding how this issue might affect all levels of CALIPSO product. The L3 ice cloud products will be updated later. Additionally all the science data sets (SDSs) are listed in the table to the right, click on the SDS name to go directly to the description. Definition: Longitude at the grid cell midpoint. Definition: Latitude at the grid cell midpoint. Definition: Altitude at the grid cell midpoint. Definition: Bin boundaries used for ice cloud total extinction coefficient (channel 532 nm) histogram. Three boundaries are reported at each bin: lower boundary, middle boundary and upper boundary. Definition: Bin boundaries used for ice water content histogram. Three boundaries are reported at each bin: lower boundary, middle boundary and upper boundary. SDS parameters derived from models or data sources other than the CALIPSO are marked as “external”. Definition: Mean of all pressures reported within the latitude/longitude/altitude grid cell derived from the Modern Era Retrospective-Analysis for Research (MERRA-2) reanalysis product provided to the CALIPSO project by the GMAO Data Assimilation System. Definition: Standard deviation of all pressures reported within the latitude/longitude/altitude grid cell derived from the Modern Era Retrospective-Analysis for Research (MERRA-2) reanalysis product provided to the CALIPSO project by the GMAO Data Assimilation System. Definition: Mean of all temperature reported within the latitude/longitude/altitude grid cell derived from the Modern Era Retrospective-Analysis for Research (MERRA-2) reanalysis product provided to the CALIPSO project by the GMAO Data Assimilation System. Definition: Standard deviation of all temperature reported within the latitude/longitude/altitude grid cell derived from the Modern Era Retrospective-Analysis for Research (MERRA-2) reanalysis product provided to the CALIPSO project by the GMAO Data Assimilation System. Definition: Mean of all relative humidity reported within the latitude/longitude/altitude grid cell derived from the Modern Era Retrospective-Analysis for Research (MERRA-2) reanalysis product provided to the CALIPSO project by the GMAO Data Assimilation System. Definition: Standard deviation of all relative humidity reported within the latitude/longitude/altitude grid cell derived from the Modern Era Retrospective-Analysis for Research (MERRA-2) reanalysis product provided to the CALIPSO project by the GMAO Data Assimilation System. Definition: Mean of all tropopause height reported within the latitude/longitude grid cell derived from the Modern Era Retrospective-Analysis for Research (MERRA-2) reanalysis product provided to the CALIPSO project by the GMAO Data Assimilation System. Definition: Standard deviation of all tropopause height reported within the latitude/longitude grid cell, in kilometers; derived from the Modern Era Retrospective-Analysis for Research (MERRA-2) reanalysis product provided to the CALIPSO project by the GMAO Data Assimilation System. Definition: Minimum of surface elevation for all columns reported in the latitude/longitude grid cell, in kilometers, above local mean sea level obtained from the GTOPO30 digital elevation map (DEM). Definition: Maximum of surface elevation for all columns reported in the latitude/longitude grid cell, in kilometers, above local mean sea level obtained from the GTOPO30 digital elevation map (DEM). Definition: Median of surface elevation for all columns reported in the latitude/longitude grid cell, in kilometers, above local mean sea level obtained from the GTOPO30 digital elevation map (DEM). Definition: Number of 5 km columns within the latitude/longitude grid cell having surface type at the middle-point lidar footprint classified as land (all surface types other than water) by the International Geosphere-Biosphere Programme (IGBP). The IGBP surface types reported by CALIPSO are the same as those used in the CERES/SARB surface map. Definition: Number of 5 km columns within the latitude/longitude grid cell having surface type at the middle-point lidar footprint classified as water by the International Geosphere/Biosphere Programme (IGBP). The IGBP surface types reported by CALIPSO are the same as those used in the CERES/SARB surface map. Definition: The days of month observed flags are bit-mapped 32-bit floats indicating which calendar days of the month CALIPSO made observations within a latitude/longitude grid cell. Bits are set to true when CALIPSO makes an observation on that calendar day with the least significant bit corresponding to the first day of the month. Bit 1 is the least significant bit. Refer to the Level 3 Aerosol Data Product Description for details. Definition: Histogram of ice cloud extinction coefficient derived from the 532 nm channel in the latitude/longitude/altitude grid cell. It describes numbers of ice clouds at a specific extinction coefficient bin range at a specific spatial grid. The histogram is for ice clouds passed all quality filters only. Refer to the L3 Ice Cloud Detailed Quality Statement for more details on quality filters. Figure 1 shows an example of global histogram at night in July 2008. Figure 1. 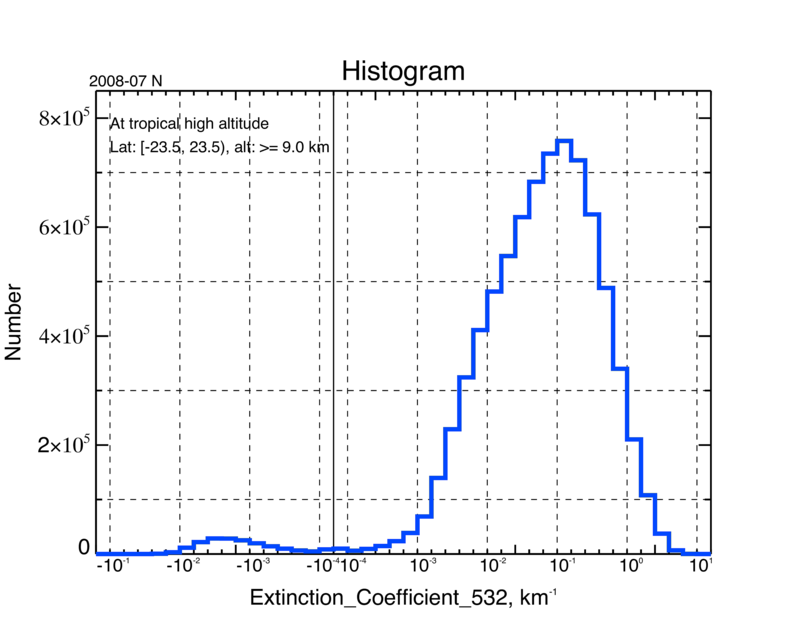 Histogram of extinction coefficient derived from the 532 nm channel at tropical high altitude, which is defined as a region with latitude between 23.5°S to 23.5°N and altitude higher than 9.0 km. The X-Axis shows the coefficient in logarithm. The dashed vertical line separates negative and positive coefficient. The Y-Axis presents the number of ice clouds observed in each coefficient bin range. It is in linear. Definition: Histogram of ice cloud content in the latitude/longitude/altitude grid cell. It describes numbers of ice clouds at a specific ice water content bin range at a specific spatial grid. The histogram is for ice clouds passed all quality filters only. Refer to the Level 3 Ice Cloud Detailed Quality Statement for more details on quality filters. Definition: Median ice cloud extinction coefficient derived from the 532 nm channel, in per kilometer, in the latitude/longitude/altitude grid cell. It is derived from ice clouds passed all quality filters and whose have valid extinction coefficient range (-0.1 km-1 - 10.0 km-1) only. 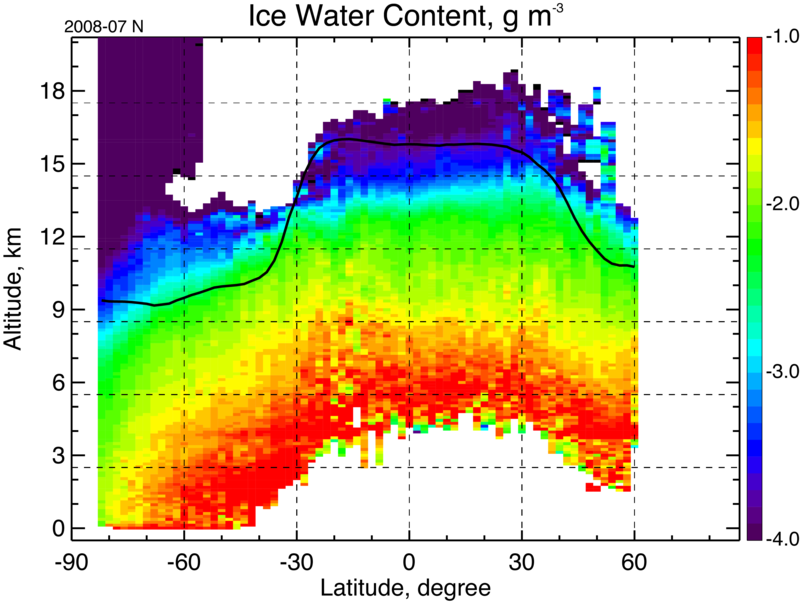 Definition: Median ice water content in the latitude/longitude/altitude grid cell. It is derived from ice clouds passed all quality filters and whose have ice water content range (-0.01 g·m-3 - 1.0 g·m-3) only. Figure 2 shows zonal averaged median ice water content as a function of latitude and altitude at night in July 2008. Note the Ice_Water_Content_Median gives the median ice water content in ice clouds only, or when ice clouds present, in each grid cell. If one is interested in grid averaged ice water content, it is necessary to consider ice cloud occurrence. Refer to the Level 3 Ice Cloud Detailed Quality Statement for more details. Figure 2. The zonal averaged median ice water content at night July 2008. The X-Axis is the latitude and the Y-Axis altitude. The ice water content is plotted in logarithm. The average tropopause height is illustrated as a black solid line. Definition: Number of lidar-detected surface or subsurface samples in the latitude/longitude/altitude grid cell. If a lidar surface is detected, the subsurface goes down to the lower vertical range which is around -0.5 km. Definition: Number of totally attenuated samples, in counts, in the latitude/longitude/altitude grid cell. If a lidar surface is not detected due to optically thick clouds, the region between the base of the bottom cloud layer and lower vertical range (~ -0.5 km) is all considered as totally attenuated samples. Definition: Number of cloud free samples, in count, in the latitude/longitude/altitude grid cell. It includes clear sky or aerosol features. Definition: Number of cloud samples, in counts, in the latitude/longitude/altitude grid cell. Definition: Number of water cloud samples, in counts, in the latitude/longitude/altitude grid cell. Definition: Number of unknown phase or not determined cloud samples, in counts, in the latitude/longitude/altitude grid cell. Definition: Number of ice cloud samples, in counts, in the latitude/longitude/altitude grid cell. Definition: Number of ice clouds samples failed to pass the quality control filters, in count, in the latitude/longitude/latitude grid cell. Information about the quality filters could be find on the Level 3 Ice Cloud Detailed Quality Statement. Definition: Number of ice clouds samples passed the quality control filters, in count, in the latitude/longitude/latitude grid cell. Information about the quality filters could be find in the Level 3 Ice Cloud Detailed Quality Statement. Definition: An 80-byte maximum character string specifying the data product name. Definition: A 27-byte character string that defines the date at granule production. The format is yyyy-mm-ddThh:mm:ssZ. Definition: A six-digit integer indicating the year and month when data within the level 3 file was measured by CALIPSO in the format yyyymm. Definition: Contains the contents of the runtime program configuration file. This file controls the sizes of dimensions used by the program, the cloud filter parameters, and an input file check. Definition: Number of level 2 granules analyzed to generate this level 3 ice cloud file. Units: no unit (NoUnits) Format: UInt_16 Valid range: 0...65,535 Definition: Number of 5 km bad profiles excluded from aggregation. On rare occasions, there are 5 km transparent columns (no indication of opacity from Atmospheric_Volume_Description) but without detected lidar surface from the Level 2 algorithm. Definition: List of included granules of L2 5 km cloud profile data product to generate this Level 3 ice cloud file.